While scientists have dispelled the existence of Bigfoot and consider it a combination of folklore and hoax, the multitude of sightings in the state of Washington — more than any other state in the country — have done little to quell the fondness for this legendary bi-ped, particularly on the campuses of the Community Colleges of Spokane (CCS). Sasquatch, fondly known as Skitch to CCS students, is the Colleges’ mascot, promoting spirit for both the school and its athletic programs. When Barnes & Noble College recently took over management of the its two college bookstores — which include Spokane Community College and Spokane Falls Community College — Skitch merchandise played front and center in school apparel and gear. “Our mascot definitely makes us unique,” said Store Manager Shami Ruggles. But perhaps what truly makes CCS unique is the breadth of programs it offers its students. CCS Students pose with the Community Colleges of Spokane mascot, Skitch. During the transition, the team brought in new merchandise and reorganized existing products, giving both stores a fresh, new look for students returning to school. Convenience was expanded with a larger variety of healthy snacks and grab-and-go food items. While the bookstores previously offered counter service, the new, open-floor design now allows students to browse the aisles and select their own textbooks — and designate either campus, or both, for pick up of their course materials. Previously, students could only choose one store location for pick up. CCS students will also benefit from the colleges’ first online bookstore website – delivering an innovative customized shopping experience and offering students, faculty and alumni the choice and convenience to shop both in-store or online. 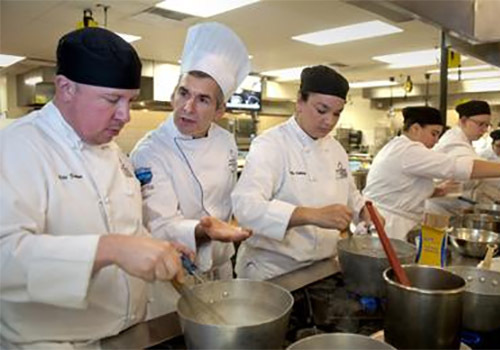 Instructor Peter Tobin (second from left) helps prepare Spokane Community College students for careers in the culinary arts. 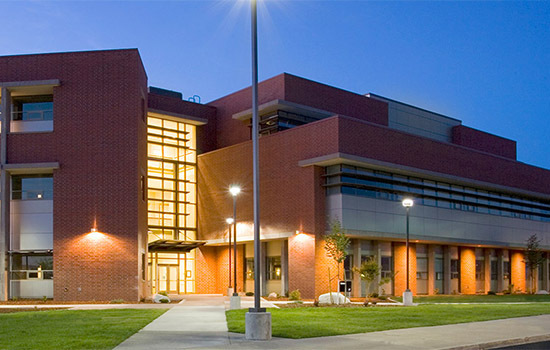 Along with textbooks, the bookstores also serve as a primary source for a variety of required learning materials that includes cookbooks, knives, sharpening stones, and thermometers for culinary students; uniforms for mechanics majors; and colored pencils, canvasses, paints and brushes for arts students.